Variant of the Simple Tenkara Fly that we wrote an article about. 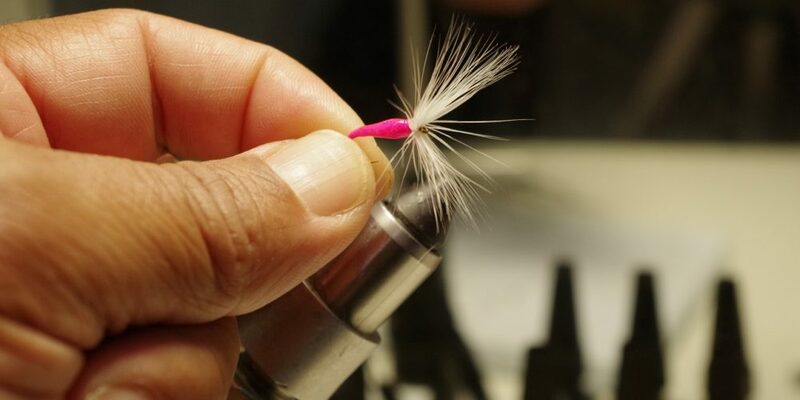 This one uses pink tying thread, a size 12 streamer hook, white saddle hackle, and UV Glue. Does not take long to tie, is effective on Bluegill and Trout, and uses minimal material. Do give it a try! New Online Article… “Simple Tenkara Fly” is Posted! Posted a new article online – “Simple Tenkara Fly”, that demos how we tie the Tenkara Fly. It’s the pattern we have been using lately. Have tied it in Olive/White and Orange/White variations and have had god success! Really like the pulsing action imparted by the reverse hackle; keeps things looking lively! Was able to get a round of fishing in today. No Bruisers but had lots of fun catching them using the two weight fiberglass rod. Fish went for tenkara flies initially, but shifted to striking “flying insects” landing on the water. So, put on the foam grasshopper and started catching them with it! Bethany Creek Park Pond Yesterday… Quick Clip Today! Fun Fishing on a Friday…! Kroger Pond with the Two Weight!